So recently I ordered a little curio from Italy to the UK, an Epiphone Country Gentleman Chet Atkins sig. Made for about two years 1989 to 1990/1, with some dispute about whether this was in Japan or Korea. The seller is a dealer. 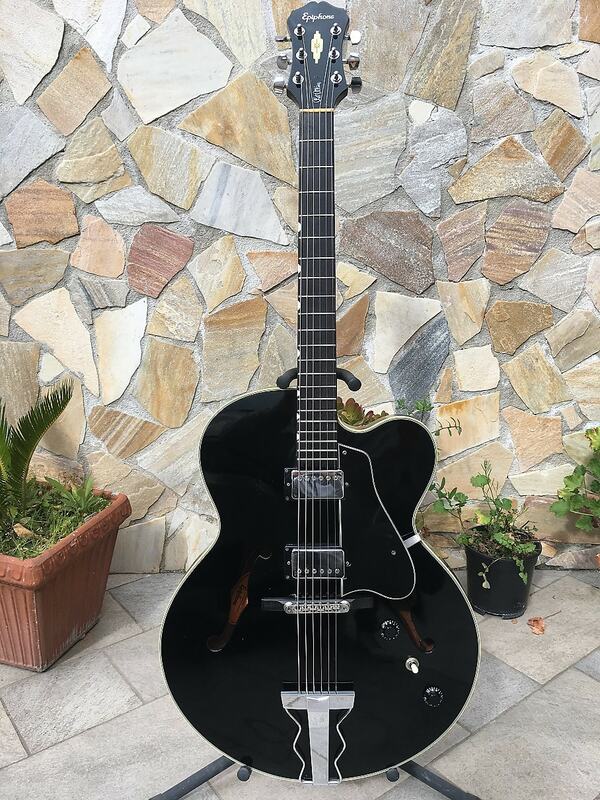 Here's the listing: https://reverb.com/uk/item/20254520-japan-epiphone-chet-atkins-country-gentlemen-eb-ebony-rif150. Please note the description of the condition. The seller confidently states it was made in Japan; I did my own research which casts doubt on that. 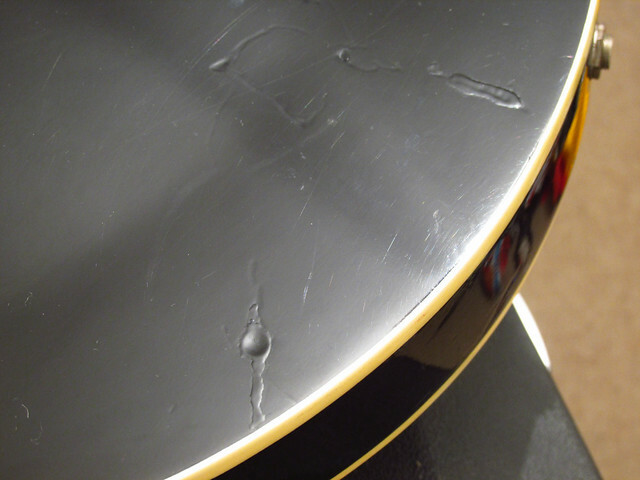 I could tell there were some dents in the spruce top (spruce dents easily) and wrote to the seller to ask if there was any damage and could he send pictures. He didn't answer but sent a bunch of pictures showing no dings or damage. The guitar is black which of course makes these things harder to see/easier to conceal. The seller took a week to get it packed (which I can allow) and it shipped without a case. He didn't mention it didn't have a case; he didn't say it did either. It's always kind of weird to receive a guitar without even a gigbag, but there we go. On the one hand, the price was quite good - I've seen these advertised at $999 (although they may never have sold for that); on the other hand, it wasn't a guitar I massively wanted. I bought it because the price was right and I thought if I didn't like it I could flip it. Obviously, with a repaired crack it's unlikely any Chet collectors are going to splash out so it would more likely be a long wait for another curious punter like myself. The seller initially offered me a rebate of €30 which I felt was derisory. He has now agreed to refund but refused to pay the return shipping. Paypal have said they can only extract the amount paid (e.g. purchase price plus my original shipping cost); their return refund scheme has a ceiling of £15. The return will likely cost me £50 + insurance, so let's say £65. At the end of the day I quite like the guitar. I'm not usually into humbuckers but these sound good and pokey; i like the lack of binding on the fingerboard. I also suspect this seller has been deliberately dishonest and definitely hampered my chances of selling on. I don't particularly want to lose £45-£50 to a dishonest seller into the bargain. Interestingly, since they advertise themselves as being a shop they are subject to EU distance selling regs which means they technically have to pay the return. Obviously, getting the money off them is another matter. One final note, Reverb were absolutely ****ing useless. If I hadn't paid with Paypal I'd have no comeback. I had suspected as much when you read about their dispute resolution on the site. One of their "musicians" will mediate, apparently (God help us). What this means is that someone called Chris wrote to me after I'd started the Paypal claim begging me to close it as it was against Reverb and not the seller (I guess they channeled the payment). I wrote back to him and booked a time for their offered phone call. It never happened and they never answered the subsequent emails. The phone number on the site doesn't work; the chat button on the site doesn't work; the emails aren't answered. I can tell you this, I will never use Reverb payments ever ever. What do y'all think? He says he'd rather not have it back. I didn't get a great pick of the binding repair, but it's very obviously cracked and repaired after impact damage. I was thinking of asking for €100 to €150 rebate. Send it back, eat the shipping, learn to be a bit more cautious buying off reverb. MisterBoh, guitarlifestyle, NicDo and 14 others like this. It's 20yr. old. The seller was not forthcoming about the condition, but requesting a rebate makes you sound entitled. Either return it or keep it. MisterBoh, bluesoul, NicDo and 2 others like this. Actually 30 years old. I guess I am entitled in that he listed dishonestly. He did offer a rebate already, remember, just a crappy one. He has said he doesn't want it back, so that at least makes it open to ask for a rebate. If he says "no", it goes back. I'm just thinking it through. Actually 30 years old. I guess I am entitled in that he listed dishonestly. He did offer a rebate already, remember, just a crappy one. He has said he doesn't want it back, so that at least makes it open to ask for a rebate. If he says "no", it goes back. No more 'doing math in my head' lol. So he's offering a full refund? That is your only recourse. 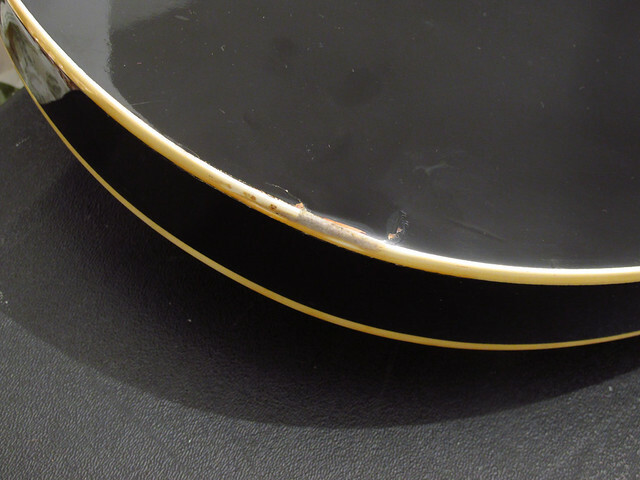 Those damages in the pics can't really be repaired for under the guitars value IMO. As you know it's an unusual guitar - 17" spruce-ply top, center plank, unbound board with thumbnail inlays and reputedly custom1wound pickups. If you really like it keep it because they just don't show up too often. C'mon, a 17" semi? But if you're the kind of person who is thinking about selling when you're thinking about buying, think about sending it back. You won't make money selling it and the damage would bug a lotof people. Return it. Eat the shipping if necessary. It's a matter of principle. Keep trying to get Reverb to stand up to its reputation for protection. I never assume anything i buy is going to be mine forever, and trying to explain those repairs to would be buyers later will only eat your soul. Apparently Reverb’s business model was built on the premise they can settle any dispute with a partial refund. The more often I hear case like yours, the more apparent it becomes. I have never bought off Reverb as I don’t believe they adequately protect a purchaser from an unscrupulous seller. My mantra is “Sell on Reverb, Buy on EBay”. MisterBoh and FiestaRed like this. But isn't PayPal the protection here? Reverb haven't tried to do anything at all. If you like the guitar as it is and can justify the price you paid, take the €30 rebate and then leave appropriate negative feedback. You're not going to reform the seller, but you can put a little ding in his rating. I hear more and more stories like this about reverb. They really do seem designed to protect the seller. I've also dealt with a seller that clearly misrepresented an item. Its a shame because I don't do much business with them anymore as a result. I just don't trust Reverb. According to the OP, Reverb attempted to intervene and broker a partial refund. The OP had already filed a claim through PayPal who offered a full refund but not reimbursement for return shipping. EBay does a much better job by locking the seller’s eBay and PayPal accounts until the issue is resolved. With eBay’s Buyer Protection, if an item is not accurately represented by the seller (including damage), a full refund and prepaid return shipping label are guaranteed. 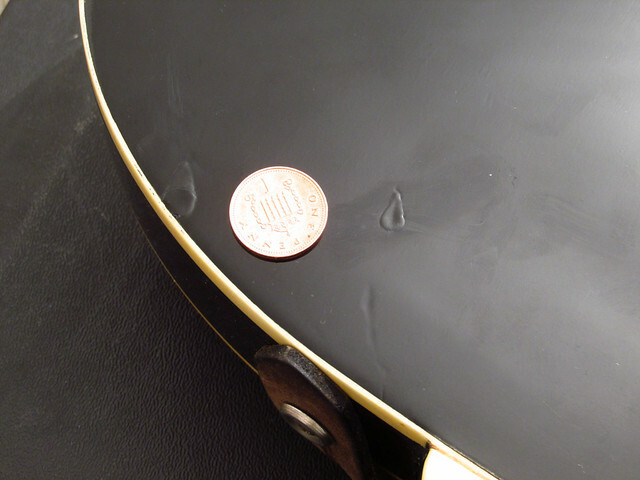 There is no debate, undisclosed damage or repaired damage are not acceptable in a “good used condition” musical instrument. Jon C, tarheelalum and scolfax like this. As a man of principle, I'd be furious with the obviously deceptive practices of the seller. I'd eat the shipping and immediately return it out of principle, as well as completely washing my hands of something that would otherwise be forever tainted. Jon C, daacrusher2001, modavis99 and 4 others like this. The seller deceived you. Do not reward him with a sale, especially a sale that is a couple hundred (likely) above what he deserved to get anyway. If you have to eat the shipping then eat it, but don't let dishonest pricks get over on you. You let it happen once, then it happens twice, and then it gets to be a habit. fretnot, tarheelalum, AaeCee and 2 others like this. Does paypal reimburse you fully with proof of shipment, or upon item's arrival back with seller?